An explanation on the CI “Certificate of Identity” from the Labor Attache U Moe Aung Khaing from Myanmar Embassy in Bangkok and Mr. Pattarapot, (Director of Migrant Labour Department) from Ministry of Labour. The CI “Certificate of Identity” objective is to identify all migrants in Thailand and registrate their workplaces. The CI will replace the purpose of the current Pink Card as a permission to stay in Thailand and makes it eligible to get the blue book work permit. All migrants in Thailand are required to obtain a CI or apply for a Burmese Passport. You can pay in advance for the CI at any Seven Eleven, Family Mart and other counter services. The payment requires 300 baht and 10 baht for service fee. You will have to tell when and where you will apply for the CI. Upon payment you receive a receipt. You have to apply for a recommendation letter at local labor office with the payment receipt that you received in step 1. After you received the recommendation letter from the local labor office, you can apply for a CI at a CI station. There are 2 CI stations in Sumusarkong, 1 in Sumupakang, 1 in Mae sot, 1 in Mae Sai and 1 in Ranong. In total there are 6 CI stations that will open soon. They are awaiting permission from the government. Go here or discuss the possibilities with a broker. After you received the CI, you can apply for a visa that will cost 500 baht and you will get a work permit without cost. If you want to change employer, first you have to get a resignation letter from the local labor office, it will cost about 100 baht. Then you will have to pay another 900 baht at the local labor office in the place that you are going to live. Warning – Beware of cheating brokers and corruption. Only deal with brokers that are known to provide good service. If you feel like brokers are exploiting migrants, you can complain to the Myanmar Embassy Labor Officer Mr. U Moe Aung Khaing. Migrants with a pink card and a household registration document don’t necessarily need to apply for the CI “Certificate of Identity”. 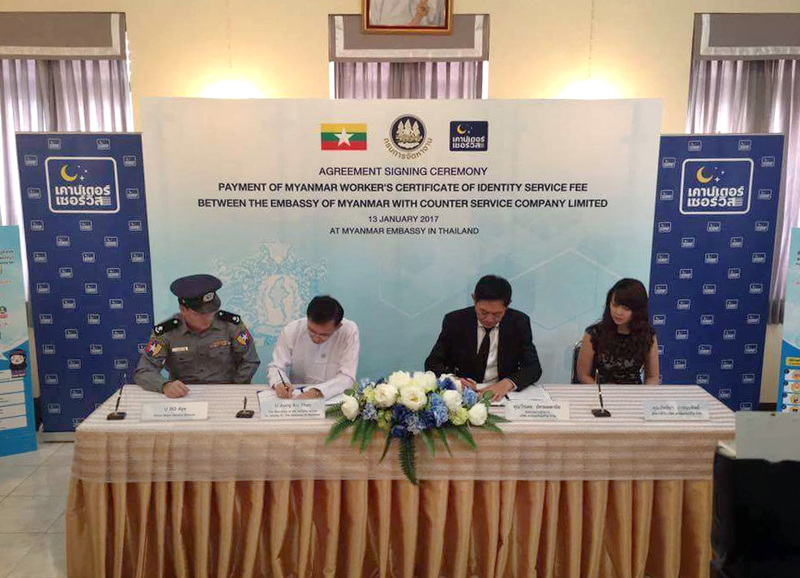 They can also directly apply for a Burmese Passport and a work permit (blue book). They can apply at the Myanmar embassy in Bangkok. The application costs 1050 baht. They can also request a “permission to travel letter” to go back to Myanmar, and apply for a Burmese Passport in Myanmar. They need to be sure to be back in time in the allowed timeframe to travel outside the working area, or the pink card will be dismissed on return. If more time is required, you can apply for a Thai visa in Myanmar and on return apply for a work permit (blue book). Migrants who only have a Purple Temporary Passport can extend their visa. That extension announcement was already given on December 31st 2016. Migrants with a paper work permit can also change it for a blue book work permit. For more than 1 million fishermen the pink card will expire soon. They have the opportunity to get an extension. One-stop-service centers will provide the registration process starting on 1/2/2017 until 31/3/2017. The extension will only last until the 1st of November, 2017. During the extension period, they will have to apply for a CI “Certificate of Identity”. Migrants can’t stay with only a pink card, eventually everybody have to apply for a CI or Burmese Passport. By the year 2020, all registration processes regarding CI and Temporary Passport extensions will cease, and new migrants will have to go through the MOU system in order to come and work in Thailand. Process of changing your Pinkcard to a CI – explained in Burmese.